In The USA there is another bright light city located in the state that brought us Frank Sinatra, Bruce Springsteen and not forgetting Jon Bon Jovi. 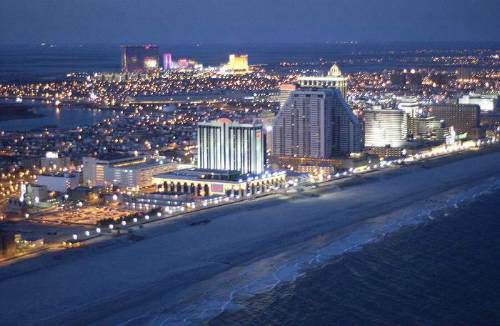 For a really wild East Coast weekend there is only one place to head and that is Atlantic City. This seaside town gained notoriety in the 1920s for Whiskey bootleggers during prohibition, it became a favourite hotspot with gangsters of the era and exuded glitz and glamour as portrayed in the TV series "Boardwalk Empire". Today it is the gambling capital of The East Coast and thanks to the backing of some well known Vegas tycoons boasts a number of luxury resorts, high roller Casinos and just a little touch of old fashioned sparkle. The Trump Taj Mahal promises to bring a slice of New York style to Atlantic City, whether it does or not remains to be seen but, who really cares? This resort is tremendous fun. The hotel has just over 2000 rooms and suites. If you're feeling flushed book into one of the Grand Suites where you will enjoy 1200 Square feet of living space, panoramic views of The Atlantic Ocean and luxurious bathroom including your own jacuzzi.The Taj boasts a number of restaurants from fine dining to sandwich bars including my favourite, Dynasty serving superb Asian fusion cuisine. Guests can relax in the spa, enjoy the pool or indulge in a little retail therapy before even venturing onto the gaming floor. If you enjoy a flutter, dress to impress, sip a cocktail at the bar and then take your pick of over 2000 slot machines or chose a seat at one of the 200 tables for Blackjack or Roulette. "The Baccarat Pit" is The Taj's high stakes gaming salon and Poker Players may be familiar with "The Poker Room" which hosts the USA Poker Championships. Atlantic City is the perfect excuse to extend your New York City break. The quickest and most convenient way to get there is by train, departing from Penn Station. The journey time is around one and a half hours compared with nearly two if you travel by car. Sit back, relax, take in the scenery and be pleasantly surprised by the great service provided by Amtrak.